One day, Gopal, a rich man in his town was walking in the garden in his home. In the garden, he saw his servant Somu standing idle without doing any work. Somu was starring at the Garden scissors what was lying down on the ground. Gopal asked Somu, "Hey Somu, why are you standing this. 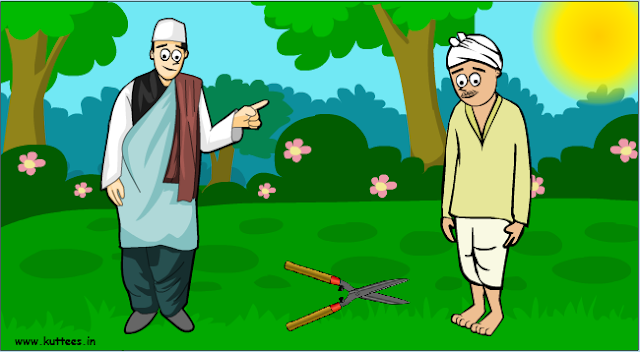 I asked you to cut the grasses in the lawn"
Somu replied, "Sir the scissors are very hot, i couldn't hold them. That is why I am waiting for them to get cool". Gopal felt very bad about his foolish servant. He told Somu that if hot things are drenched in cool water, they would get chilled down. He asked Somu to get some water and pour it over the scissors. Somu did as what his master had said and was surprised to see the scissors getting cooled down after pouring the water. Then he cut the grass in the lawn. Days passed by, one day Gopal had to go to a nearby town for some business purpose. His father was very sick that day. So he asked Somu to stay with his fater and take care of him. In the evening, when Gopal returned back he was shocked to see water all over his father's room. His old father was wet and was shivering a lot. 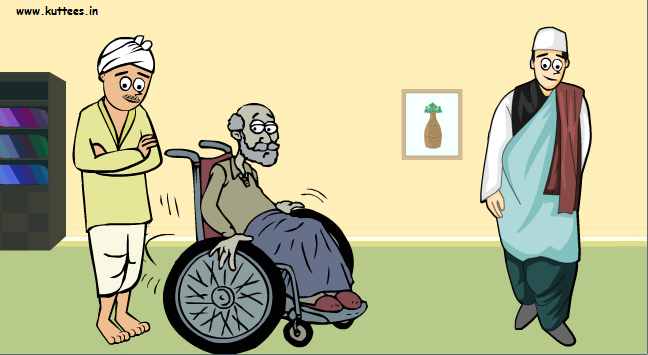 Gopal got very angry and called Somu to ask what had happened. Somu replied, "Sir, after you left I touched the old master. He was very hot. So, as you taught me on the other day I poured few buckets of water on him. But, unlike the scissors our old master started shivering more after that." Gopal got very angry upon this. He scolded Somu for his foolishness. He immediately took his father to the hospital in his town.